I discovered these almond pears with almond liquor many years ago in the Ball Blue Book. I used to make them up as a special treat for my husband's great uncle, Bill. 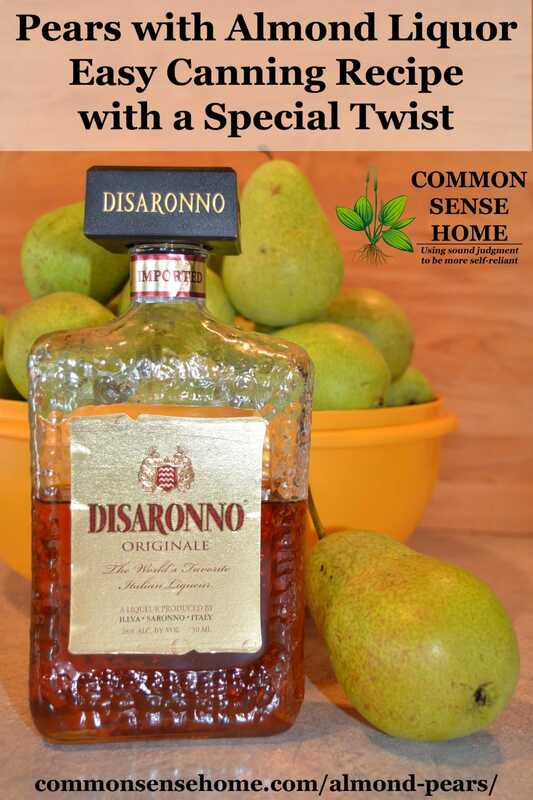 Bill wasn't a big fan of fruits and vegetables, but the splash of Amaretto in these pears won him over. I always made sure to keep a couple jars of pears stashed in his kitchen cupboard. Bill passed away a few years ago. 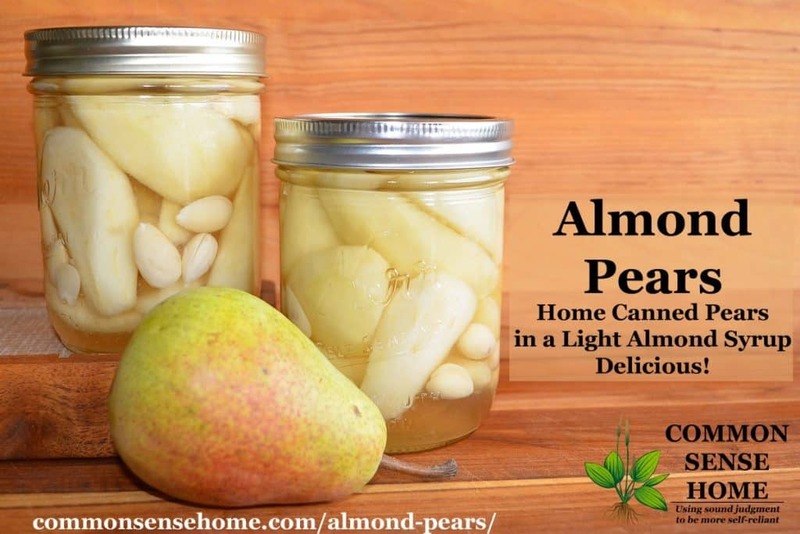 Since then I've been experimenting with cinnamon pears and pears canned in juice, but this year there was a bumper crop of pears, and I had a hankering for the lovely almond flavored yumminess of this recipe. The syrup is heated, so most of the alcohol cooks off, leaving behind a subtle almond flavor. Want even more almond? Add some almond extract. It's all good. 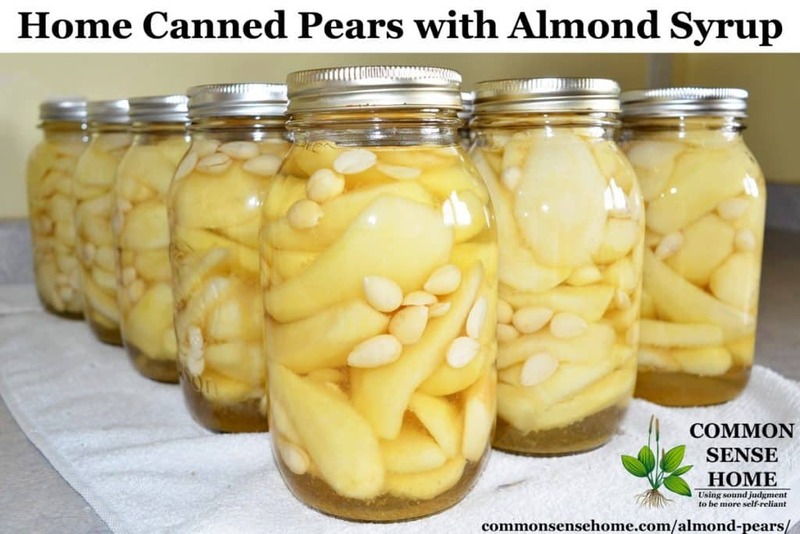 As you can see from the photos, we canned several double batches of these lovely almond flavored pears. You don't need to use the same brand of almond liquor that I used. I just happened to have that one in the house because it's a favorite of a family member. Prepare boiling water canner. 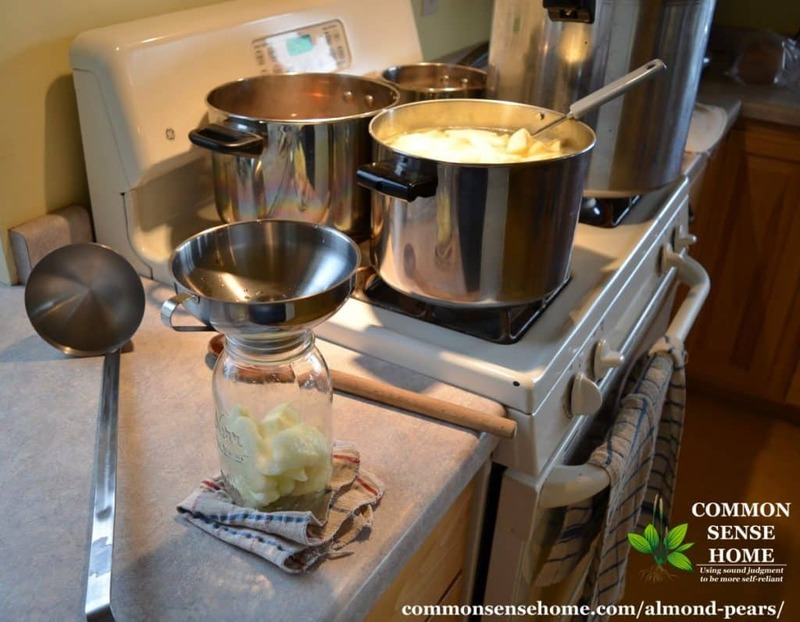 Heat jars in simmering water until ready for use (or run through dishwasher). Wash lids in warm soapy water and set bands aside. 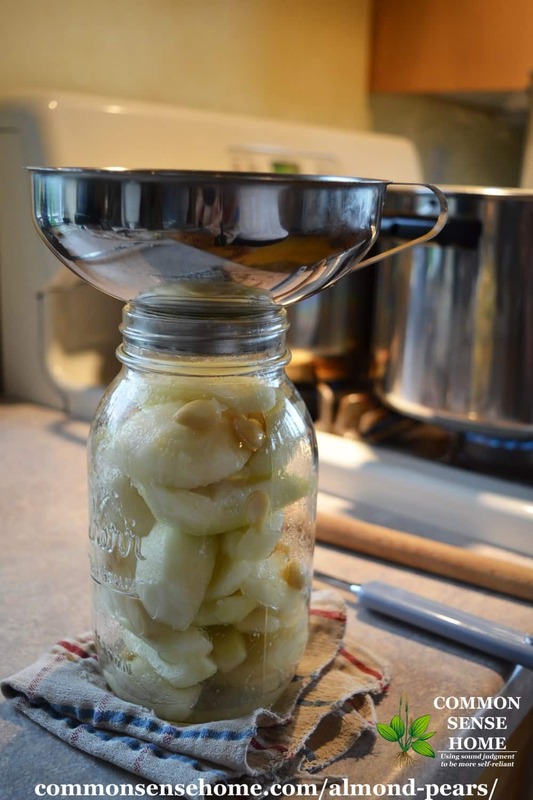 I used my larger pressure canner to can my pears and just let the steam vent because I canned quart jars instead of pints. I think we did three double batches this past weekend, if I remember correctly. Prepare pears by peeling, coring and halving them. To prevent browning, submerge pears in a mixture of 1/4 cup lemon juice and 4 cups water. Prepare syrup by combining sugar and 4 cups water in medium saucepot, stirring until sugar dissolves. Bring to a boil. Reduce heat and simmer 5 minutes. Drain pears. Cook pears gently in water in a large stainless steel put until hot throughout. Set aside, keeping hot. 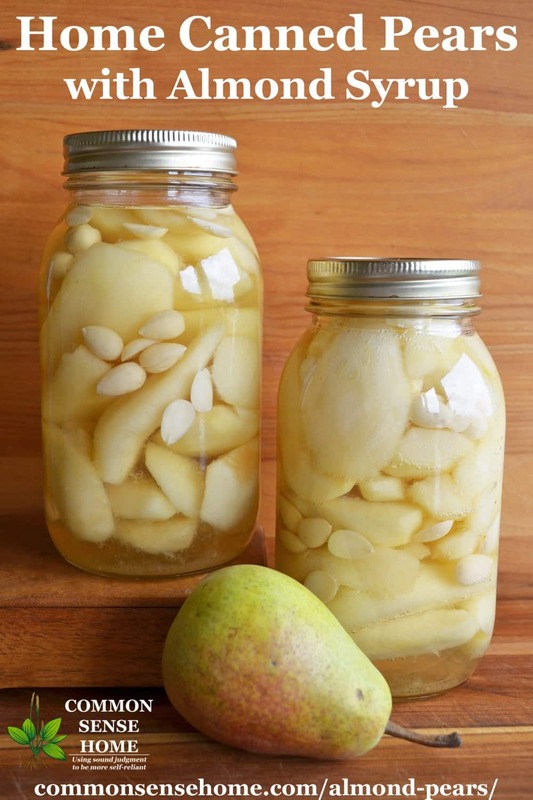 Pack hot pears into hot jars, leaving 1/4 inch headspace. Add 1 tablespoon almonds to each jar. Remove syrup from heat, stir in almond liquor. Ladle hot syrup over pears, leaving 1/4 inch headspace. Remove air bubbles and adjust headspace, if necessary, by adding hot syrup. Wipe rim. Center lid on jar. Apply band until it is fingertip tight. Process pint jars in a boiling water canner for 20 minutes and quarts for 25 minutes, adjusting for altitude. Remove jars and cool. Check lids for seal after 24 hours. Lid should not flex up and down when center is pressed. Yields about 5 pints. Recipe may be doubled, just make sure not to overcook pears when heating them through so they don't turn to mush. 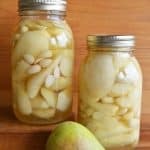 Home Canned Almond Pears – Light almond syrup and blanched almonds pair well with the natural sweetness of perfectly ripe pears. Prepare boiling water canner. Heat jars in simmering water until ready for use (or run through dishwasher). Wash lids in warm soapy water and set bands aside. Recipe may be doubled, just take care not to mush your pears while preheating them. I hope you enjoy this recipe as much as we do. We're also drying a bunch of pears, and have made up autumberry-pear jam and Cranberry-Pear Jam. What's your favorite way to enjoy pears? Do you have a source of local pears? I'm so grateful we have neighbors who are willing and able to share their abundance. (We swap things back and forth all the time.) These pears came from a tree that is over 50 years old and still going strong. That's my kind of fruit tree. You didn’t say what kind of pears to use. Are Bartletts too soft? I use whatever pears I have available, commonly Bartletts. The key is to not let them get too ripe, because they will soften during processing. I guess if the pears are overly ripe you’ll end up with almond-pear butter! Peach cobblers can be the same way – if the peaches are too ripe you can end up with a mess. Yep – tasty but messy! Beautiful jars full of wonderful pears!!! Thanks for sharing this.